I had a fantastic and far ranging conversation with a fellow design professional this afternoon, sparked by the demolition of six historic homes on 31st Street just a couple days ago. One of the things we talked about was a disconnect between preservation professionals and developers who want to work in urban neighborhoods (specifically older established neighborhoods). Sometimes despite a general desire to "do the right thing," they end up on the wrong side of the argument. Having worked on all phases of the development process (from land assembly, planning, and zoning to design, financing, and construction), I can identify with the need to be selective about sharing information publicly until the project is ready. Most developers working in older urban areas, however, tend to take this too far - holding their cards too close to their vest will breed distrust and antipathy from concerned neighbors and organizations. It sets up a needless climate of conflict. 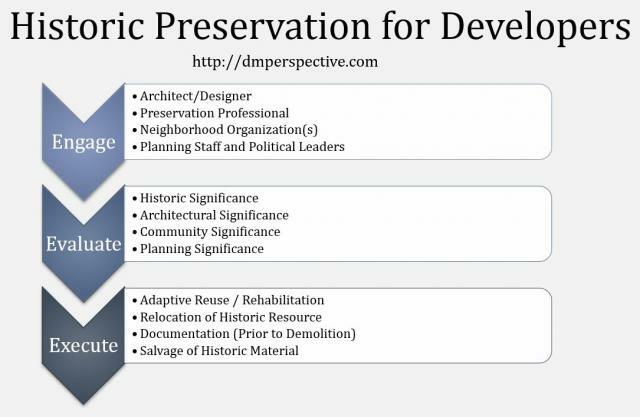 Here is a brief overview of how to include preservation in the development planning process: Engage, Evaluate, Execute. Unless you are a historic preservation professional or a developer who focuses on adaptive reuse and historic preservation yourself, ENGAGE A PRESERVATION PROFESSIONAL to advise you on the project during the preliminary planning. Simply put, unless you are an expert, you do not know if a property is historic or has preservation value. Don't assume that you know more than you do. Just because a building is dilapidated or has undergone prior remodeling or has no "character" does not mean that it is without value. It is also important to appropriately engage and communicate with any community organizations in the area, any individuals with particular association to the property, and City planning staff. Not all will need all the information, but hiding important information from any of these groups can result in problems further down the road. Engage a design professional to help plan and create necessary drawings to describe the project to the necessary constituencies. Historic Significance - Are they associated with historic people, events, or development patterns? Architectural Significance - Are the buildings significant examples of an architectural style or a specific designer? Community Significance - Are the buildings significant to the community for some other reason? Planning Significance - Are the buildings part of any established plans or neighborhood goals? Again, do not assume that you are qualified to establish the answers to these questions unless you are, well, qualified to answer them. If the buildings are determined to be significant in some way, then it becomes your task as a developer to incorporate that information into your planning and development process. Resolution of the impact of your project on the historic resource may involve any of the following (or some other creative solution). Adaptive Reuse / Rehabilitation - Adjust plans to incorporate the historic resource into the redeveloped site. Relocation of Historic Resource - Move the building to a new site. Many times, a developer will donate the cost of demolition to get the building moved, a win-win. Documentation (Prior to Demolition) - Professionally document the buildings through photos and historic research. An Iowa Site Inventory Form can be prepared and filed at the State Historic Preservation Office. Salvage of Historic Material - Be proactive about finding salvage opportunities like architectural resale stores, individuals, and local salvage organizations.